When we finally called it a day with our old weather station last month, we sort of said "never again". I stuck it out for about two weeks then admitted to my cravings and ordered a new system. We've taken a bit of a leap and invested in what promises to be a much better system. It's well regarded by weather watchers all over the world and should give many years of faithful service. One of the problems with the previous setup was the location. While the Teapot Field was handy, it was also slightly sheltered by the house and buildings. It was originally put there to transmit to the computer in the office at side of the house. But that computer is also consigned to the scrap heap, so we had a blank sheet to start planning on. 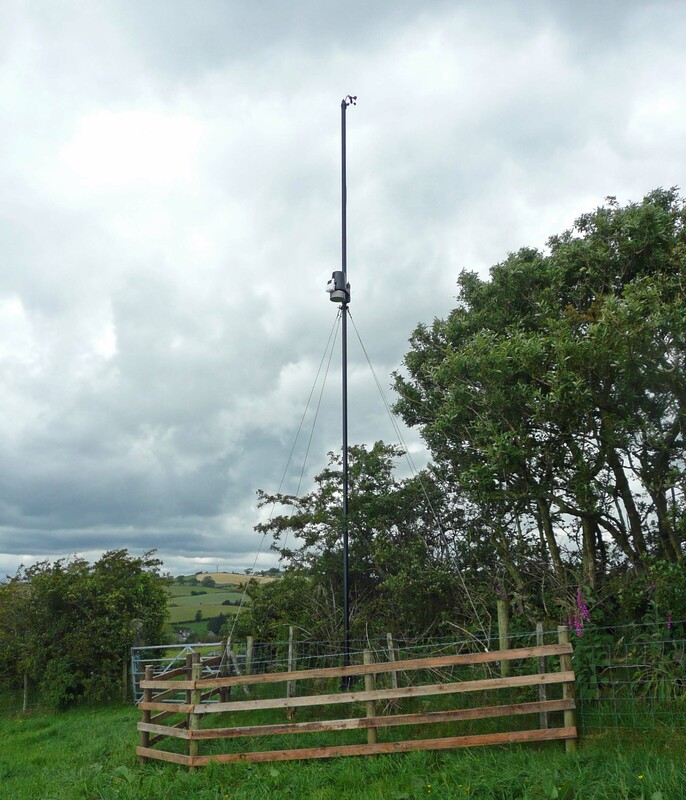 So the new setup - a Davis Vantage Pro 2 - is up on top of a hill (about 130 metres above sea level), on a purpose built pole (7.5 metres), with the anemometer at the top and the other instruments half way down. It's fenced in by the hedge in Plucker and transmits the data to a console in the kitchen. From there it is transferred to a computer and onwards and upwards to the internet. Old Weather Data - now discontinued - but see above! The Live Weather page used data collected by our Weather Station. Very little manual intervention was needed to collect the data and transfer it to the website. We had an Oregon Scientific WMR968, set up in a field near the house (Teapot Field). It had solar powered sensors which monitored the temperature, humidity, barometric pressure, wind speed and rainfall. They had a wireless link to a touch screen console in the house and transfered the data every minute. The console was connected to the serial port on a computer, and loaded into the Weather Display programme. This analysed and interpreted the data and created all the charts and graphs etc. Every 15 minutes the data was sent (using ftp) to the Live Weather page. The weather information is a snapshot of the conditions at the time of collection in one place. Currently the sensors are exposed to the elements, which means the temperature is in full sun (if the sun is shining!). We hope to add a Stevenson Screen at some point, which will give more realistic figures. A new sensor has been fitted and we're back to recording all the vagaries of temperature and humidity. I'm sorry we missed all the recent high temperatures. We are having a slight problem with collecting the weather data, so many apologies for the absence and inaccuracies of update information. Apologies for the long gaps between weather updates. We were having a new electricity meter fitted so I powered off the computer before I left for work. Unfortunately it was not done on the expected day.